Note: For this special sneak peak we only have the thumbnails, above. There are four colorways for Lacquered Linen, the most “useful” of all the designs. Colors are Crème Lacquered Linen, Green Lacquered Linen, Orange Lacquered Linen and Charcoal Lacquered Linen. Likely, they’ll sell a lot of those Creme and Charcoals, but you know us: We are digging that burnt orange and rich avocado big time. Funky and rich retro classiques. Note, other companies have introduced linen-pattern laminates over the past few years. See all our laminate research in our Kitchen / Countertops category here. Greek keys are a signature Adler motif. While we’re not big fans of the pattern — too contemporary for us — we do appreciate the relatively small scale. Colors are Orange Greek Key, Blue Greek Key and Charcoal Greek Key. And, among all the three new Jonathan Adler designs for Formica we also like that he created (1) tone-on-tone prints and (2) made them multi-directional. That is, the pattern runs both horizontally and vertically in the same measure. Faux butcher block notwithstanding, this is what we like to see in a patterned laminate: Tone-on-tone, multi-directional prints — abstract, ideally, because laminate is a man-made material, it does not need to pretend to be something else. Okay so maybe these aren’t tone-on-tone, well, not in namby pamby way. We like ’em. Cuz we like krazy. Colors are Blue Malachite and Charcoal Malachite. Nicely done, Formica and Jonathan Adler! In particular, we appreciate the COLOR. We presume these will be available after official launch Jan. 21. 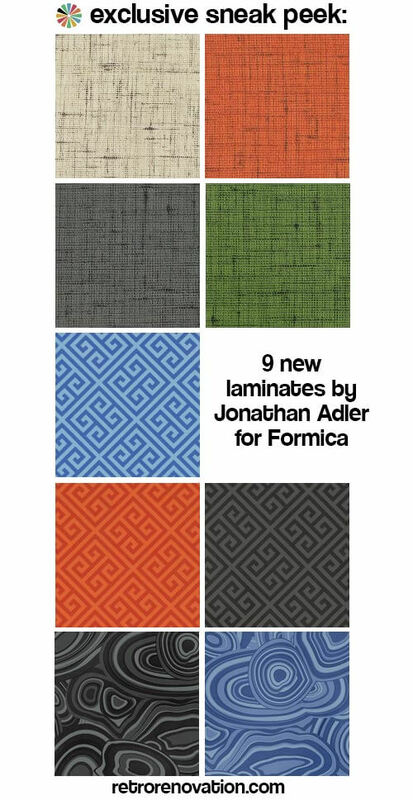 Formica Corporation, the inventor of laminate, has partnered with iconic potter, designer, and author Jonathan Adler to create nine bold new designs exclusively for Formica’s 2015 Residential Line. The new laminate patterns will be unveiled at the Kitchen & Bath Industry Show (KBIS) in Las Vegas in January 2015. The collection will include many of Jonathan’s signature patterns in an array of hues ranging from subtle to bold. Perfect for countertops, accent walls, cabinets and more, each style will reflect Jonathan’s spirit of iirreverent luxury and represents a bold update of a classic material. “Formica® Brand laminates are iconic and it has been a dream to include some of my favorite patterns, colors and motifs in the collection. The uses for laminate are limitless; I can’t wait to use the styles from my collection in my stores and design projects-I want to laminate everything in my life with the new line,” said Jonathan Adler. 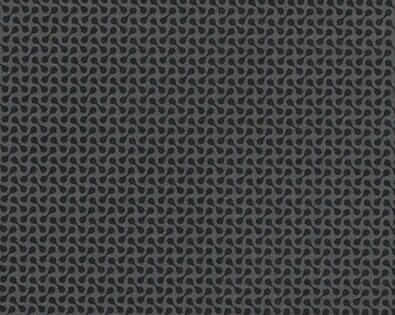 Formica Group globally leads the industry in the design, manufacture and distribution of surfacing materials. Formica Group is a global group of companies consisting of Formica Canada, Inc., Formica Corporation, Formica de Mexico S.A. de C.V., Formica IKI Oy, Formica Limited, Formica S.A., Formica S.A.S., Formica Taiwan Corporation, Formica (Thailand) Co., Ltd., and Formica (Asia) Ltd., among others. 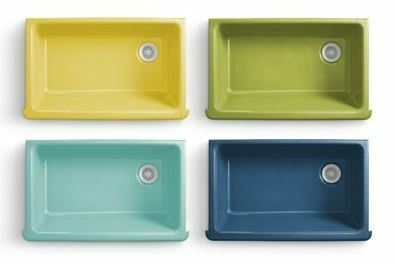 Above: Jonathan Adler worked with Kohler in 2012 to introduce several sink colors. I am not sure if these are still available. 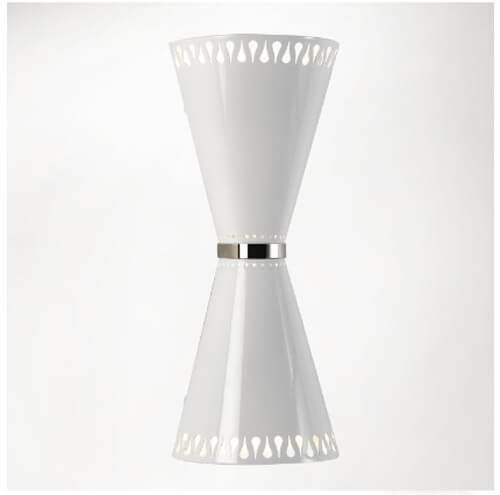 Above: Jonathan Adler has some very pretty lighting in his collection for Lamps Plus. This is a pretty big collection — still available. Above: And there was a Jonathan Adler Happy Chic collection for JC Penney in 2013. Not sure of the status of this collection either. I love the Lacquered Linen Formica! I had been considering the Pionite Linen but I think they are a tad to muted. I like the more bold design on this Formica and the colors! Wish there was a turquoise in there but the green has me rethinking my kitchen plans. Love it! I like these but imo Adler has gotten really derivative–not just the laminate, his whole oeuvre. It’s nearly all a version of something that’s already been done. 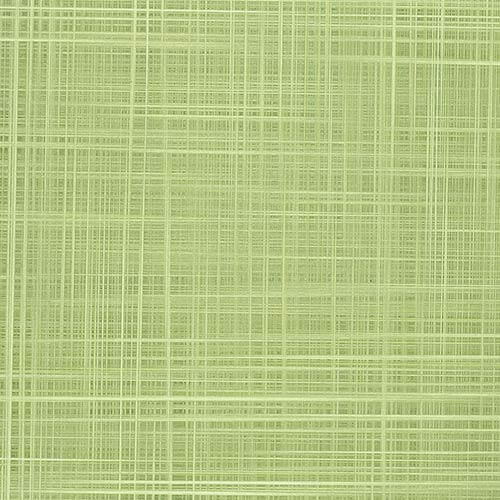 I would rather see good old Formica Irish Linen in a couple new, a couple old, colorways. I don’t mind the green linen. Would look great with pale yellow cabinets, and a nice green braided rug on the floor. Could even work as a new top on a chrome dinette set. The blue Greek key-ish one I could see working with a room with bright white floors, bright white cabinets, and accents Bitossi and Willow china? Am I high? 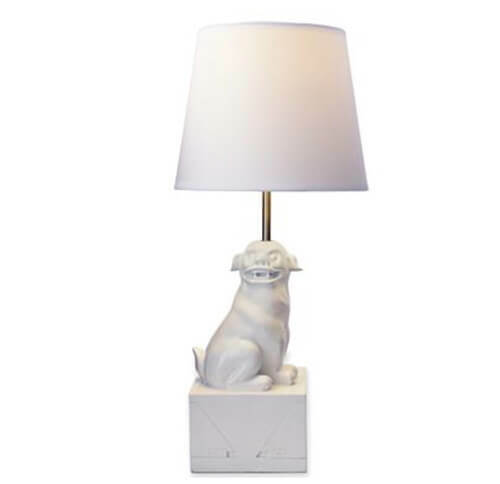 I think it could be cute with Chinoiserie in general. Palm Beach? But I’m not usually huge on avocado *or* blue. Is it my imagination that I remember Adler being into pink? I would love a pale opalescent/glittery/cracked ice pastel Formica. There’s options for tiny mosaics in glass tile in various lovely cupcake shades of pink and jade and lilac, but no pastel Formica for them. Yes, a pale opalescent/glittery/cracked ice pastel would be so lovely. How about in a lollipop array of color. Sigh. Looks like Formica has discontinued 10 of the Adler patterns 🙁 …buy it while you can get your paws on it!